How to add text to MP4 video? How to Add Text to MP4? MP4 is a digital multimedia format with the filename extension of MP4. It’s commonly used to store video and audio files. MP4 is a most popular format nowadays, mainly applying in embedded device, such as phones, MP4, iPod, iPad, iPhone, PSP and PS3. The default social network, like Facebook and Twitter, and major video websites, like YouTube, both support MP4. How to add text to MP4? What we need is a simple but fully-fledged software. 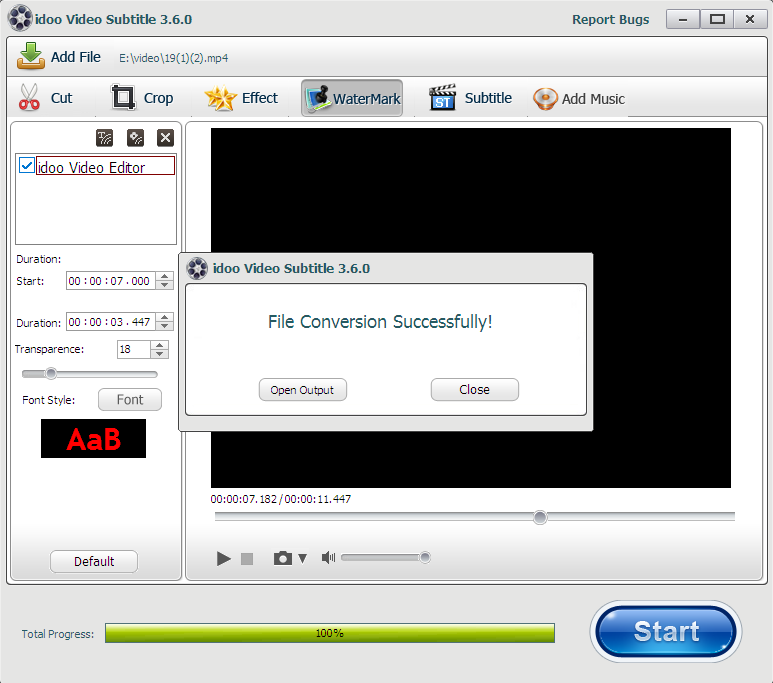 The function of Subtitle of idoo Video Editor can help us add text to MP4 video. We just need to inport video and set the timeline for video. Then we can convert MP4 to any other output formats. when we add text to MP4, we can set location of subtitle and color of subtitle line. Meanwhile, we can do other advanced settings. For example, we can add watermark, music and effects to video and we can also trim video. If you just want to add some words to video, you need to use watermark function of idoo Video Editor. We choose the function of Add Text Watermark to add text to video and adjust starting time, typeface and transparency of text in video. The following action steps will show you how to add text to MP4 easily. 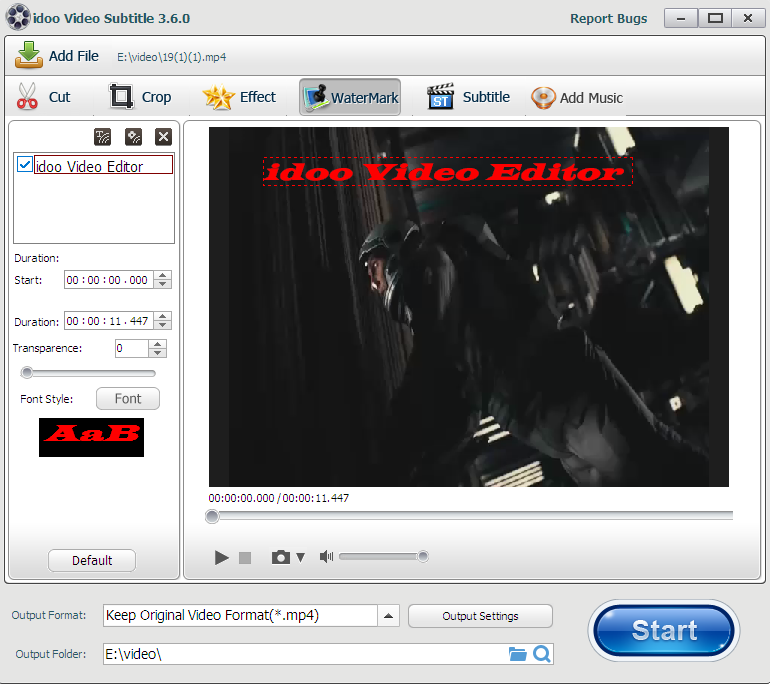 1Start idoo Video Editor and open Watermark to import MP4 video you want to add text. As shown below. 2Click Add Text Watermark from the control panel and then input text you need to add. You can add multiple text content. Besides, you can also drag text to adjust the location of text in video image. Finally, set transparency, starting time, typeface and so on. 3When all ready, click Start to begin editing. Then we can get the video we need. As shown below. Article Resources Related To 4K Video Editing And Converting Issues(2019) Seven Secrets About Convert 4K Video To Other Formats The Easier Way To Convert 4K Video To 1080P With High Quality How to edit your videos use idoo editing software? idoo Editor's Tech specs and reference How to cut and trim videos? How to Add Music to HD Video? How to Add Subtitles to MOV Video? How to Add Special Effects to MOD Video? 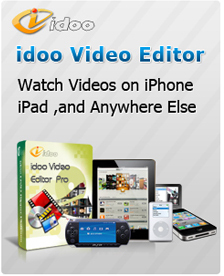 The Best Windows Video Editor - idoo Video Editor The Good Video Editing Software - idoo Video Editor How to Convert Video to Twitter? What Does idoo Video Editor Can Do for Your Tablet Computer? What Can idoo Video Editor Do for Your Facebook?